Are you having difficulty reading words in a book? Do street signs appear blurry? It may be time to visit an eye doctor. Family Health Centers of San Diego optometrists offer a wide range of vision care services to help improve your eyesight, including prescription glasses and contact lenses. We also offer screening for cataracts, a serious eye condition mostly associated with aging, as well as glaucoma, a group of eye diseases that can lead to blindness. 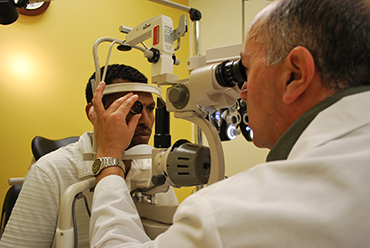 FHCSD vision clinics also provide comprehensive eye exams, including color blindness, retinoscopy and cover and visual acuity tests. Monday: 8:30 a.m. – 7:00 p.m.
Closed for lunch 12:15 – 1:15 p.m.